HL Triangle Construction (RHS triangle Construction) : A triangle is said to be a right triangle, if one of its three angles is a right angle. Step 1 : Draw a line segment BC of given length. Step 2: Draw ∠BCX of measure 90 0 . Step 3 : With center B and radius equal to the hypotenuse AB, draw an arc of the circle to intersect ray CX at A. Step 4 : Join BA to obtain the required triangle ABC. Construct a right triangle PQR in which ∠Q = 90 0 , PR = 6 cm and QR = 4 cm. Step 1: Draw QR = 4 cm. Step 2 : Using compass, at Q draw ∠RQK = 90 0 . Step 3 : Cut off RP = 6 cm. Step 4 : Join P and R.
Now we get the required ΔPQR. 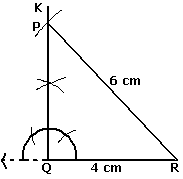 1) If the sides of triangle are 3cm,4cm and 5cm then what type of triangle you will get after constructing it? 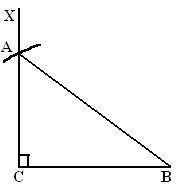 2) Construct a right angled triangle ABC where AB = 4.5 cm, AC = 5.8 cm and angle A = 90 0 . 3) In a triangle PQR, if ∠P=90 0 and ∠Q= ∠R, find the angles of the triangle .